The odds of successfully navigating an asteroid field isn’t “approximately 3,720 to 1!” The actual odds would entirely depend on what asteroid field you were talking about and a variety of other factors. 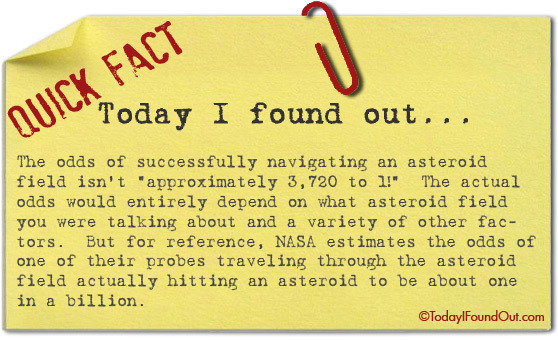 But for reference, NASA estimates the odds of one of their probes traveling through the asteroid field actually hitting an asteroid to be about one in a billion. Asteroids within asteroid fields are hundreds of kilometres apart – even if you did enter an asteroid field, you probably wouldn’t botice. Sure, but what if you were being chased by a squadron of TIE Fighters (ignoring the fact that actual Twin Ion Engine fighters would probably actually only go a little faster than Abraham Simpson dragging a boulder…SCIENCE!!!)? Remember; Han was deliberately getting close to the asteroids, which has got to be as dangerous as flying close to cliffs and the ground at the very least.